Last year we hosted our first Thanksgiving dinner at our house. We had never prepared a turkey before last year but since we had figured it out then, we decided that we could do it again! My husband is a great cook and is always willing to take on the majority of the cooking which allows me to really enjoy the decorating. When I created my Thanksgiving tablescape last year, I shared it on here so I decided to share this years too! 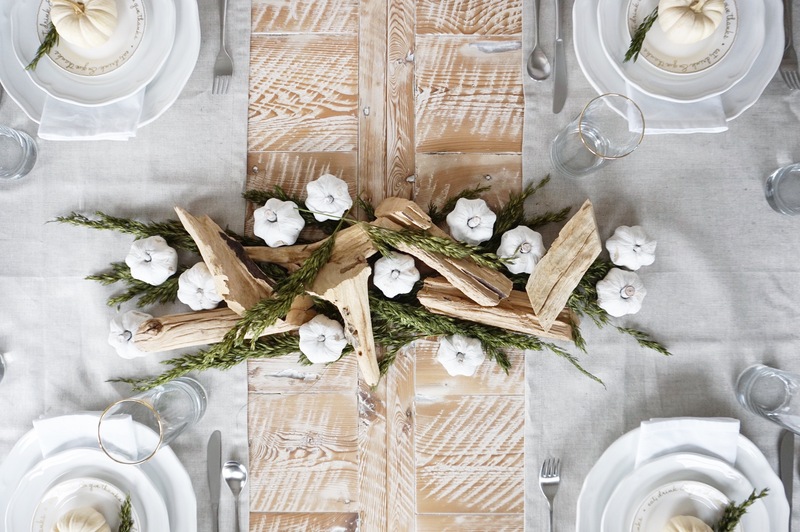 You’ll notice that I used some of the same items from my tablescape last year, because realistically I could go and buy new items for each holiday, year after year, but I dont think my husband would be too pleased with that. Sooooo to keep the decorating on budget, I find the easiest way to freshen it up is to add in some new items while incorporating some old ones. I had purchased the centrepiece white pumpkins last year at Homesense and still love them so decided to use them again as my main focus. For a colour scheme I was drawn to more of a neutral, natural look this year with only a splash of my go-to gold. The wood pieces in the centre of the table I had bought from Homesense for Emsley’s first birthday party decor and decided to incorporate them into the mix. The greenery I purchased this year from Michaels. The white plates and table runners are both from IKEA and the gold rimmed glasses are a steal from the Dollar Tree at only $1.25 each! Gotta love it when you find a good bargain! 🙂 The “eat, drink, & give thanks” plates are a few years old and were originally purchased from Homesense. The gold writing on them tied in nicely with my gold rimmed glasses making it the perfect amount of gold accent. You might also notice that our dining table is different than the one I shared last year. We ended up getting a new one from a local company who makes rustic wood furniture out of reclaimed barn wood. The old one was from Restoration Hardware and this one is from a company called Prairie Barnwood, check them out if you like the look and live locally as they have great stuff!